Even with the router removed from the table, it’s just as well to leave the baseplate attached when doing trimwork by hand. The baseplate gives you a larger surface to hang on to. Makita 1100; Milwaukee 5615-5624; DeWalt 616-618; Bosch 1617-1618, 1617 EVS; Rigid 2930 Combo Kit; Porter Cable 690, 890, 7529, 97529, 8529; Hitachi M12VC (Fixed & Kit). 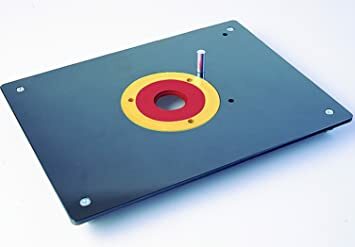 Bosch 1619-1619EVS, Freud FT2000; DeWalt 625 Standard Blank Plate (#24883), with 3-1/4” Plate Opening: Blank plate option for drilling custom mounting holes for standard size routers. Blank plate option for drilling custom mounting holes for larger routers.